Future of Sourcing Digital is thrilled to launch a new series titled “Women Global in Sourcing.” This series strives to highlight, celebrate and acknowledge women who are pioneers and leaders in the industry and who have been influential in moving the industry forward. 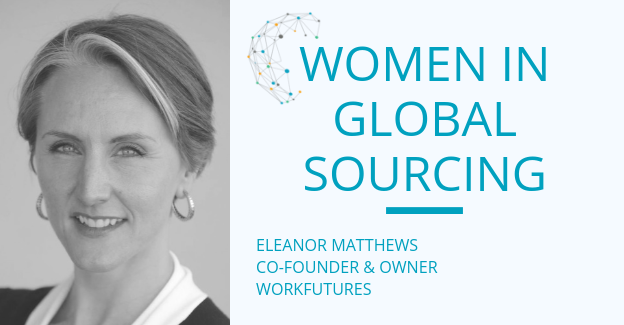 Future of Sourcing could not be more excited to feature Eleanor Matthews this week to the stage. Eleanor is the founder at Work Futures, is a sourcing expert and trusted advisor with 20 years of experience in outsourcing, business development, contract negotiation, project management and people development. Having led a number of organizations in the sourcing space, she is currently working with a portfolio of organizations in a marketing and advisory capacity focused on the future of work and the new digital sourcing and services landscape. I started my career at Logica as a developer but backed slowly away from actual coding when I realized that I was not cut out for staring at a screen and hunching over a keyboard all day. I was high energy, ambitious and, looking back, probably a total nightmare to manage so when I proposed that I get involved in more of a business role, my boss probably felt like he had little choice. Although I had found the process of cutting code tedious, I loved working with customers and showing them things in a new light, so a move into sales and marketing made sense and I had a few very happy years doing that. A new role in the advisory market felt like a logical step when I left Logica in 2003. I joined a small advisory firm and by 2009 I had realized that the traditional advisory model had flaws, so I launched Source to change that -- definitely a purposeful move. Our message of delivering positive outcomes for everyone involved in an outsourcing deal resonated with the market and in 2015 we were snapped up by a bigger player. Overall, I would say that I have made decisions about what I wanted to do and my career path has been relatively purposeful, but I have had a few lucky breaks and have been very open minded to seize great opportunities as they have arisen. Yes, I don’t regret anything that I have done. Of course, there have been highs and lows, but I firmly believe that you learn something from everything you experience, good and bad. Success is only ever real for a moment in time and the best advice I have ever been given is to enjoy my moments of success and then get over it. A very important characteristic is the willingness to have a great team beneath you. A strong leader will be comfortable having people in the team who are better than he or she is and will be happy to delegate, allow failure and celebrate success without taking all the credit. The biggest stumbling block to great leadership is a big ego in my opinion. I happen to know the answer to this – or at least one of the words. When I left my team to spread my wings in 2016, we had a “This is your Life” evening, and everyone on the team said something about me – either live or on video. The one word that everyone consistently used was “scary,” but fortunately everyone clarified that they were talking about first impressions – which I can imagine to be true. At 6 foot 2 with more energy than I know what to do with, I can be quite a force of nature on first meeting. Other than that, I think people would recognize that I am supportive and flexible as well as pretty driven. Do you think it’s possible to “have it all”—e.g., career, family—and be successful everywhere? How do you make it work? Yes, I think it is possible to have a great career, and still be a good mum, friend, wife, etc. It is a question of expectations, priorities and communication. Perfection is a cruel master – and it is possible to be successful in all these roles if you give yourself a break, make sure that you understand what your priorities are over time and adjust your focus accordingly, and let people know what they can and cannot expect of you. Also, expect to get it wrong sometimes and forgive yourself when you do.